Make your New Year’s Resolution to attend the upcoming presentations at the Darien Library to learn about current health trends in town and how we compare with local communities and the State of Connecticut. Over the span of three sessions (Jan. 12, 19 and 26), the Darien Health Department, along with renowned guest speakers, will present results of a year-long study of data related to health issues and trends in Darien. — This article is a combination of announcements from the Darien Health Department and Darien Library. 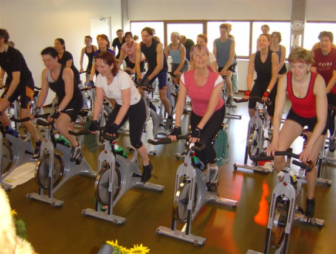 In December, America’s Health Rankings Annual Report was released by the United Health Foundation, and Connecticut was ranked No. 3 in the nation. This model reflects that determinants of health directly influence health outcomes. The health outcomes category and four categories of health determinants included in the model are behaviors, community & environment, policy, and clinical care. How does the health of Darien residents compare with that of the US, or Connecticut? What is the Fastest Growing Threat to the Health of Darien Residents? Learn how the opioid crisis is affecting families in Darien. Jayme Stevenson, first selectman; Carrie Bernier, executive director of the Community Fund of Darien; and David Knauf, the Darien health director, will all present. A panel discussion will follow. Gary Mendell is the founder, Chairman and CEO of Shatterproof, a national nonprofit organization dedicated to ending the devastation that addiction causes families. Mr. Mendell founded Shatterproof in a determined effort to spare other families of the tragedy his family suffered after losing his son Brian to addiction. Dr. Robert Zembroski is a physician, specialist in functional medicine, board-certified chiropractic neurologist, clinical nutritionist, best-selling author and motivational speaker. Twenty-three years in private practice helped Dr. Zembroski to become an expert in health topics from heart disease, diabetes, obesity, cancer, hormone-related issues, neurological dysfunctions and more. Dr. Z developed his own protocol of targeted supplementation, exercise, and specialized nutrition to ultimately become a cancer victor and author of the book Rebuild. Just-retired Darien Police Chief Duane Lovello; Alan Mathis, the president & CEO of Liberation Programs, Inc and David Knauf, Darien health director will present on the community impacts of substance abuse. 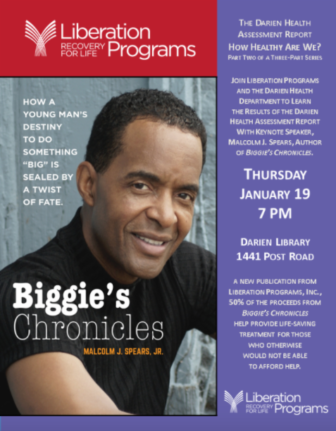 Following, Malcolm Jauval Spears, Jr. will share his struggle with addiction as told in his book Biggie’s Chronicles. The winner of Prescription Drug Abuse Awareness Slogan Contest will be announced as well. Malcolm Jauval Spears, Jr. was born in Harlem, New York City and grew up in Stamford CT. He is a graduate of Liberation Programs who went on to study drama at The University of Southern California. He is an actor, author, screenwriter, independent producer, public speaker, educator, lecturer and businessman. He authored Biggie’s Chronicles as part of his commitment to inspire people to live their dreams. It is an insightful, gritty and poignant look at what it was like to grow up black in Stamford, CT in the 60s and 70s and how a young man’s destiny is sealed by a twist of fate. Gary Morello is the Associate Minister at the Darien Congregational Church and will discuss acceptance and transformation. David Knauf, Director of Darien Health, and Caleb Moore, MD, Medical Advisor for the Darien Health Deptartment, will lead a panel discussion on chronic disease and stress in Darien. The series ends with important questions: what have we learned and where do we go from here? John Hamilton serves on the National Institute of Drug Abuse (NIDA) Steering Committee of the Clinical Trials Network, and Chair of the Community Treatment Provider (CTP) Policy Committee. John also serves as Chairman of the Advisory Board and is on the Executive Board for the Department of Mental Health and Addiction Services (DMHAS), Vice President of the Board of Directors for Connecticut Community for Addiction Recovery (CCAR) and the Regional Youth Adult Social Action Partnership (RYASAP), Chair for the CTP of Fairfield County, and is actively involved in community prevention councils in Fairfield County. Editor’s note: This article originally was published Tuesday. The time stamp was changed to make it the first item in the Darienite.com weekday newsletter. One Darien restaurant received a "C" rating, the worst in the town A-B-C ratings system, in the latest health inspection reports released by the town Health Department. Three other establishments were rated "B", and one "A." Deaths from drug overdoses, primarily opioids like heroin, rose to 900 statewide in 2016 and are expected to reach 1,000 this year, and Darien Health Director David Knauf is proposing that overdose incidents (fatal or not fatal) be reported to each local health director. A number of other diseases, health conditions and deaths must be reported to local health directors and the state Medical Examiners Office now.